Venezuela had been a rising nation, buoyed by the world’s largest oil reserves, but by the time I arrived, even high global oil prices couldn’t keep shortages and rapid inflation at bay. . .
POSTSCRIPT: I do have to point out that she contradicts herself between the first and last line. The fall in oil prices hastened Venezuela’s collapse, but it wasn’t the cause, as she recognizes in the first line. 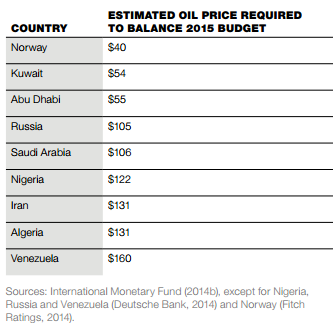 Today, the price of oil hardly matters, as Venezuela is mostly incapable of producing oil any more. Chanting death to America does not create jobs. Judging not only by this clip, but from the entire speech, it seems never to have occurred to Obama that economic prosperity might not be their aim. This always seems to be our problem with this bunch: We assume that they think like we do. This was the central folly of the Oslo agreement. It seemed to us like a really fair and reasonable agreement. I confess that I too was taken in. 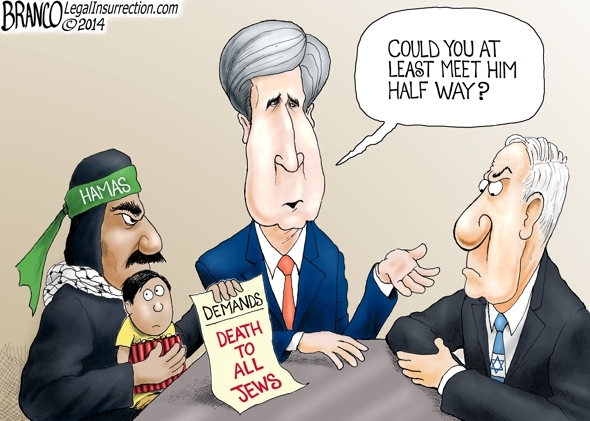 But it assumed that the Palestinians wanted peace. In the years since 1993, we’ve learned that they (and all the Islamist fundamentalists) want peace only after the complete annihilation and/or subjugation of their enemies. What was an excusable error in 1993 is sheer idiocy now. It seems that the Russians offered to dump Bashar Assad in 2012. The Obama administration refused the offer because they were sure the Assad would fall soon without Russian assistance. One of the serious concerns about the Iran nuclear deal — other than the fact that now Iran will have nuclear weapons soon — is the possibility (nay, inevitability) Iran will take the money it’s getting and use it to fund terrorism. And we’re not talking chump change; it’s over a quarter of Iran’s GDP. That kind of money can murder a lot of people. They’re not allowed to do that. They’re not allowed to do that. This fool is our Secretary of State. Can you imagine if he had been president? We should expect that some portion of that money would go to the Iranian military and could potentially be used for the kinds of bad behavior that we have seen in the region up until now. Five years ago, Turkish anti-Israel militants on a flotilla purporting to carry humanitarian supplies to Gaza ambushed Israeli soldiers who boarded their ship. A battle ensued in which a few of the thugs were killed, and a predictable international outrage followed. The prosecutor at the International Criminal Court looked into it and found no grounds to bring charges. (ASIDE: Astonishingly, given its history of hostility to Israel, the UN issued a report that fully exonerated Israel.) In a sane world, the matter would be over, but we do not live in a sane world. The ICC itself has now ordered the prosecutor to reopen the investigation, and refers to crimes having been committed. Gee, I wonder what the outcome of the case will be when the judges themselves are directing the prosecution? Under the circumstances, there could be no real doubt about whether the proceedings will be fair, but nevertheless the order makes it even more clear. It explicitly orders the prosecutor to take public outrage (i.e., politics) into consideration in his investigation. International negotiators have extended their deadline once again as they struggle to reach a nuclear deal with Iran. Negotiators had been running up against a Tuesday deadline, after initially extending a June 30 deadline amid lingering differences. On Tuesday morning, the State Department said the new deadline is now Friday, as talks continue. Amazingly, they still haven’t figured out what’s going on here. They have left mere stupidity behind, and are in willful-blindness territory now. Western observers present in Vienna for the talks linked the State Department’s behavior to jitters over media coverage revealing a still growing list of concessions being made to Iran by the Obama administration. . . Taking such an extreme step to exclude a reporter from a press briefing does not indicate confidence. It also speaks poorly of the rest of the press that they accepted this. The reason we did not [take military action] was because Assad gave up his chemical weapons. And that’s not speculation on our part. That, in fact, has been confirmed by the organization internationally that is charged with eliminating chemical weapons. How is there a strong possibility Assad will use chemical weapons — on a large scale, no less — when he gave them all up? It almost sounds like our president wasn’t telling the truth. I wonder why our allies don’t trust us? The United States has full authority and responsibility for security and defense of the Marshall Islands, and the Government of the Marshall Islands is obligated to refrain from taking actions that would be incompatible with these security and defense responsibilities.
.@CBSDavidMartin "Pentagon lawyers have determined..US has no obligation to come to the defense of a Marshall Islands-flagged vessel at sea"
You thought that treaty meant something to the Obama administration? Think again. UPDATE: David Kopel gives the Pentagon’s position more thorough consideration than it deserves, and finds it wanting. An agency-wide focus on global warming. I guess all that other stuff must be finished. Glad to hear the world’s a safe enough place now that we can waste our time on such things. Still, based on Clinton’s and Kerry’s records at State, maybe an agency-wide focus is the best possible way to prevent agreement on global warming. A large, illegal weapons stockpile was found Thursday at the home of the Palestinian ambassador in Prague, Jamel al-Jamal, Czech media reported, a day after al-Jamal was killed in an explosion there. Respekt, a Czech weekly newspaper, reported that the arsenal was enough to arm a unit of ten men. . .
Al-Jamal, 56, was killed Wednesday when a safe at his home exploded. . . Palestinian Authority Foreign Minister Riad Malki said no foul play was suspected, and claimed that the safe had been left untouched for more than 20 years. Later, however, El-Fahel told Czech radio that the safe had been in regular use. ”[The safe] was used on a daily basis at the embassy and it was opened and closed almost every day,” the embassy spokesman said. Syria will miss the deadline to give up its chemical weapons, and will face no consequences as a result. John Kerry is talking about keeping North Korea from getting nuclear weapons, which will be hard since they already have them. Why is India fighting against anti-piracy efforts? U.S. Secretary of State John Kerry praised Syrian President Bashar al-Assad Monday, saying that news that international disarmament experts had begun dismantling and destroying Syria’s chemical weapons arsenal and the equipment used to produce it represented “a good beginning,” and Assad deserved credit for honoring the terms of a deal reached last month to secure and destroy the regime’s weapons. The ambitious U.S.-Russian deal to eliminate Syria’s chemical weapons, hailed as a diplomatic breakthrough just days ago, hit its first delay Wednesday with indications that the Syrian government will not submit an inventory of its toxic stockpiles and facilities to international inspectors by this weekend’s deadline. This was the deadline’s very first deadline; we can expect all future deadlines to be missed as well, since the administration has now shown it doesn’t care about them. They don’t might looking like buffoons internationally, so long as they can save face domestically. The media, of course, is happy to play along. The supposed fatwa does not appear on a website of Khamenei’s fatwas maintained by the Islamic Revolutionary Guards, and Khamenei didn’t mention it when asked a direct question. Did Obama even bother to check before spouting this? (And would it be better if he did, or if he didn’t?) Too bad he’s not so feckless in his dealing with his domestic adversaries; he has identified his real enemy, and it’s not Iran. Seeming to no longer fear a U.S. attack, an emboldened Bashar Assad is adding to his list of demands in exchange for handing over Syria’s chemical weapons, fueling concerns in Washington that — with Russia’s backing — he’s succeeding in turning the tables on Secretary of State John Kerry’s negotiating effort in Geneva. “They’re just kind of playing with us,” Rep. Buck McKeon, R-Calif., chairman of the House Armed Services Committee, told Fox News on Friday. Obama is running a clinic on how to make yourself a laughingstock on the world stage. Obama says never set a “red line” in regard to Syrian chemical weapons. Is he trying to look like a fool?! Today, after five years of Obama restoring our image in the world, the British no longer think the “special relationship” is worth preserving. All this stuff, and particularly all this stuff, matters. Kim Jong-Un has his ex-girlfriend executed. Samantha Power, America’s new ambassador to the United Nations, skipped a major Security Council meeting Wednesday on the alleged chemical weapons attack in Syria, a move that drew sharp criticism considering her past comments denouncing the council’s inaction on the violence. The strike early Wednesday could stand as the deadliest such incident since the country’s civil war began, with reports of hundreds dying. The U.N. Security Council called an emergency meeting Wednesday afternoon to debate the allegations, but ended up issuing a statement that fell far short of what the U.S. and its allies wanted. Yet Power herself did not attend the emergency meeting. She was instead represented by career diplomat Ambassador Rosemary DiCarlo. . . The UN, being what it is, probably wouldn’t have taken satisfactory action even with our ambassador present, but it might have helped. I guess she had other priorities than representing the United States at the UN. UPDATE: Power was on a personal trip. Franklin Roosevelt declined to take simple, quiet measures that could have saved hundreds of thousands of Jews from the holocaust. The release of the Lockerbie bomber was linked by the Government to a £400 million arms-export deal to Libya, according to secret correspondence obtained by The Sunday Telegraph. An email sent by the then British ambassador in Tripoli details how a prisoner transfer agreement would be signed once Libya “fulfils its promise” to buy an air defence system. The disclosure is embarrassing for members of the then Labour government, which always insisted that Abdelbaset al-Megrahi’s release was not linked to commercial deals. The people running our foreign policy are desperately in need of adult supervision. I guess this is a good thing, but I’m horrified that this didn’t happen decades ago. Argentina has been reprimanded by the IMF for its phony-baloney economic reporting. Another milestone in the annals of the “Arab Spring”: Egypt has re-legalized slavery. Meanwhile, our practitioners of “smart diplomacy” are content to watch it happen, without applying even the tiniest bit of pressure. It’s disappointing, but not surprising, to see the effort to create free cities in Honduras fail. I wanted it to succeed, but it wasn’t at all clear that Honduras was the right place. You are currently browsing the archives for the Geopolitical category.